You do know that everything made between October 1st and 31st has to be pumpkin flavored, right? I’ve been loving smoothies lately. They fill me up, kill my sweet tooth, and I can sneak in things like flax or spinach without my taste buds even noticing. Well, the other day my taste buds actually *did* detect the ground flax seed in my fruit smoothie, but it almost tasted like graham crackers… which reminded me of graham cracker crusts… which reminded me of pies… which made me think of pumpkin pie. You following? 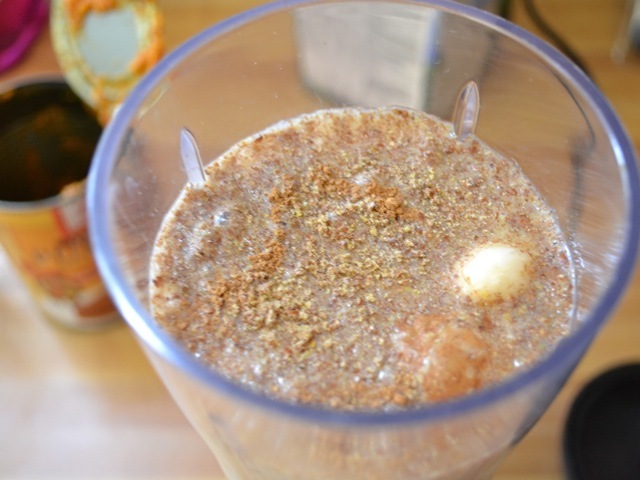 Anyway, the ground flax really adds a pie element to the smoothie, so I wouldn’t suggest skipping it. My local grocery store was out of that wonderful $1/can generic pumpkin puree, so the cost of this smoothie reflects pumpkin prices that are more like what the rest of you are seeing ($1.69 per 15 oz. can). You can get about four smoothies out of each can. Just transfer the left over puree to a resealable container and it will stay good in your fridge all week and be ready when you need it for more smoothies! Oh yeah, one more thing. The banana has to be frozen. Frozen bananas are what give smoothies their wonderful ice cream/milk shake like texture. I usually peel and freeze 3 or 4 bananas at a time (each broken in half). Then, I use 1/2 to a whole banana per smoothie. The bananas will brown slowly in the freezer, so try to use them within a week or two. Recipe makes a larger serving than what is pictured here. 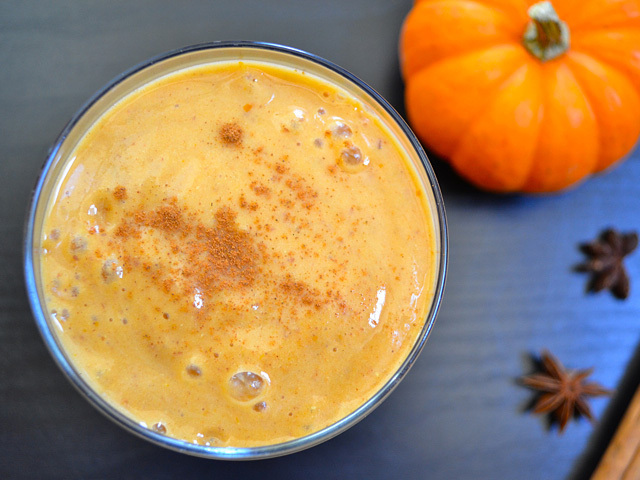 This pumpkin smoothie is not only delicious, but it's healthy too! Low in fat, sugar, and high in fiber and nutrients. 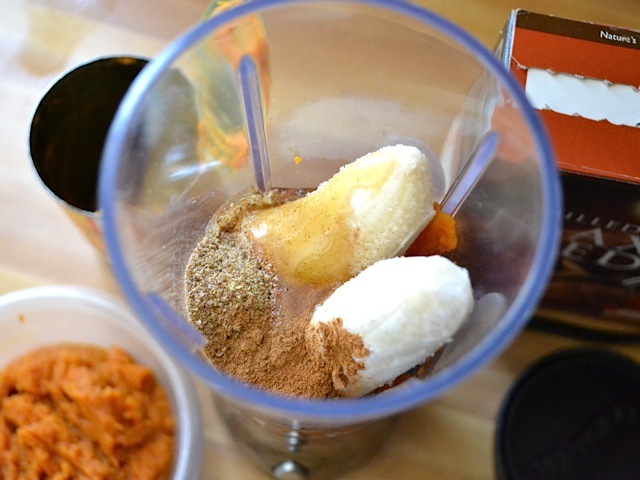 Put all of the ingredients in the blender. 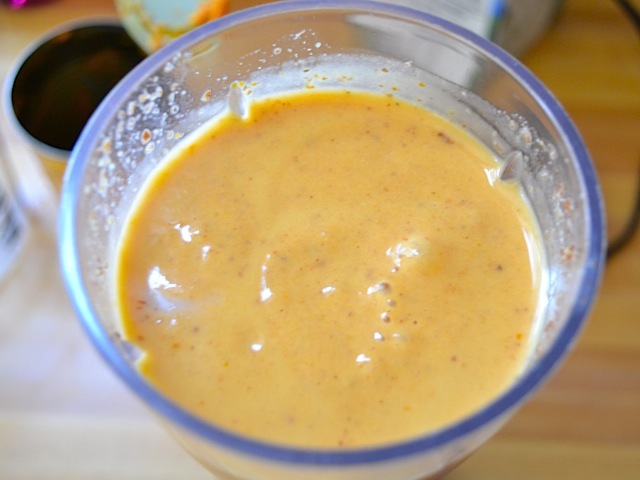 That’s pumpkin puree, a frozen banana, honey, ground flax seed, cinnamon, pumpkin pie spice, and soy milk. 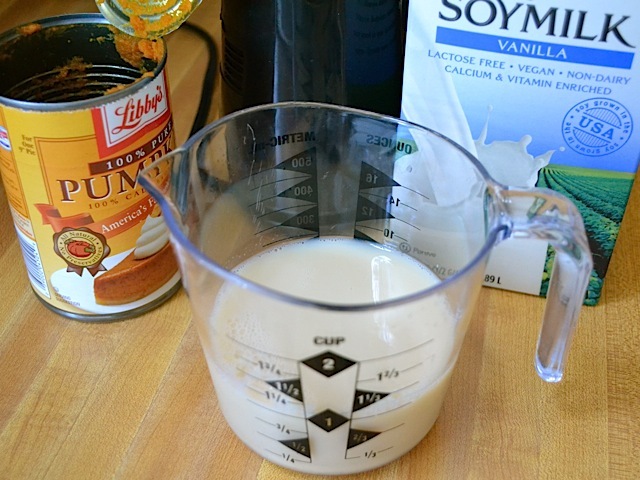 I like to pour in the soy milk last, it just makes everything easier. Save the rest of the pumpkin puree in a resealable container. It will stay good in the fridge for about a week… and trust me, you *will* want to make another one. Pour the soy milk in last. I used vanilla flavored soy milk. If you have plain, you’ll want to add a little vanilla extract. Now it’s ready to blend. I bought this little single serve blender a few years ago and it’s been working nicely for me ever since. For about $15 (mine was $13), it’s worth not having to haul out the huge blender every time I want to make one serving. Plus, the blender part doubles as a cup. Blend it up good until it’s completely smooth. Then drink it immediately! It’s thick, delicious, and so pumpkiny! October is the best month of the year. Hands down. Thanks so much for this recipe! It was the perfect festive after school treat for my middle schooler. We like our smoothies a little bit thicker, so we cut down on the milk a bit and added a 1/2 scoop of whey protein power (vanilla flavor). I think this is a new favorite! Made this this morning (it’s not autumn, but pumpkin sounded pleasant regardless) and it was great! I added 1 tsp. of agave nectar instead of the tablespoon of honey because it’s what I had on hand and it was still plenty sweet. Next time I’m going to try only 1/2 cup vanilla soy milk and 1/2 cup cottage cheese to see if that helps cut some of the sweetness while also making it a bit more filling. Okay so it looks like the internet is conspiring against me this morning. If it doesn’t work this time, consider my rating to be 5 stars. Delicious! I love how thick and creamy this was. I topped this with some pumpkin spice granola and it was incredible. Thank you! Mmmmm, yeeeees! I added about a tablespoon of almond butter because my flax has become dedicated to my dog – this is delicious! I could also see myself using some oats soaked in the almond milk overnight. This will be one of my regulars, thank you! 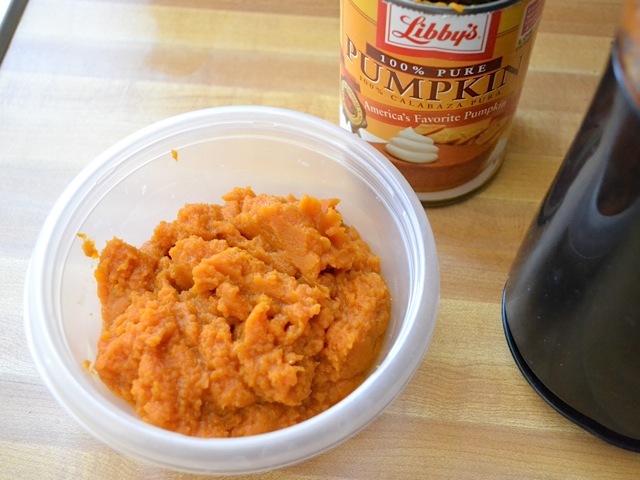 I used some Allspice instead of pumpkin spice….end result was delicious! The vanilla soymilk is key though. 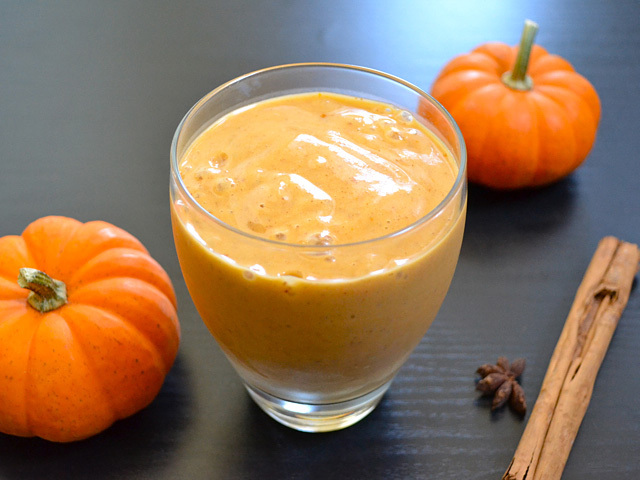 I use real, cooked pumpkin for it (instead of canned) and it is downright my favourite smoothie! What a terrific use of pumpkin! This sounds amazing! I have a can of pumpkin puree just waiting to be used, but do you have any ideas for substitutions for bananas? I’m allergic and have a hard time getting the same “meatiness” in a smoothie without them. I may put some almond butter in to bulk it up, but I’m trying to think of other ingredients. Unfortunately, I really haven’t found anything that even comes close to the texture of a frozen banana in smoothies. I freeze my pumpkin in ice cube trays, then pop them out and store them in a baggie in the freezer. 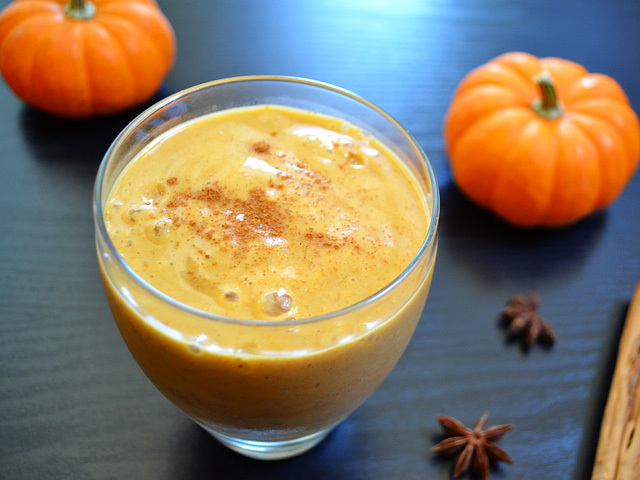 I haven’t tried this specific recipe – but I often make pumpkin smoothies without bananas and the texture is great! Where does one get pumpkin pie spice? iv’e looked at bulk stores and grocery stores.. can’t find it anywhere! Hey you think of everything! Thx! I wanted to make this for dessert tonight but I am completely out of milk! If I substitute water will it be too thin?? You could maybe try some almonds, oats, or graham crackers. This was absolutely delicious! Thank you so much for posting this recipe! Today I made this with an addition of about 1/2 c. of cottage cheese. Holy moly, was that a great idea! It made it unbelievably creamy and filling, and the cottage cheese adds extra protein to keep you full longer. It almost tasted like a pumpkin cheesecake! LeAmbre – I bet it would be good with sweet potato! After all, people make sweet potato pies just like they make pumpkin pies and they’re delicious!